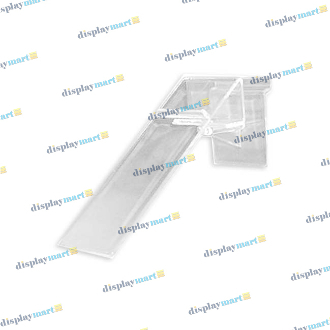 DisplayMart.com has the ideal shoe display for your slatwall panel! This angled styrene shelf is sized perfectly for displaying a single shoe by the heel. The 180 degree turning capability allows you to display the shoe horizontally against the slatwall panel, at an angle, or pointed straight out. The choice is yours! Line them together to create a complete shoe section, or spread them apart among other products as accents to your displays. Each shoe shelf has a beautiful crystalline finish to blend in with your pre-existing d?©cor.